The cabinet portrait format was introduced in 1866 by the London photographer Frederick Richard Window. The cabinet portrait was a photographic print mounted on a sturdy card measuring 41/4 inches by 61/2 inches. (roughly 11cm x 17cm). Window believed the larger dimensions of the 'cabinet print' (4 inches by 51/2 inches or approximately 10.2 cm x 14.1 cm) would enable the professional photographer to demonstrate his technical and artistic skill and produce portraits of a higher quality than the smaller carte-de-visite would allow. Although introduced in 1866, the cabinet portrait did not really establish itself until after the invention of dry plate photography and the reduction in plate exposure times to a fraction of a second. The arrival of "instantaneous photography" around 1880 allowed the cabinet format to be used to its full potential. The cabinet photograph increased in popularity in the late 1880s and 1890s, as the demand for carte- de-visite portraits declined. Much larger than the carte-de-visite, the size of the cabinet format made it particularly suitable for groups and family portraits. The introduction of "instantaneous photography" ensured that even restless and fidgety children in family groups could be captured sharply by the camera. 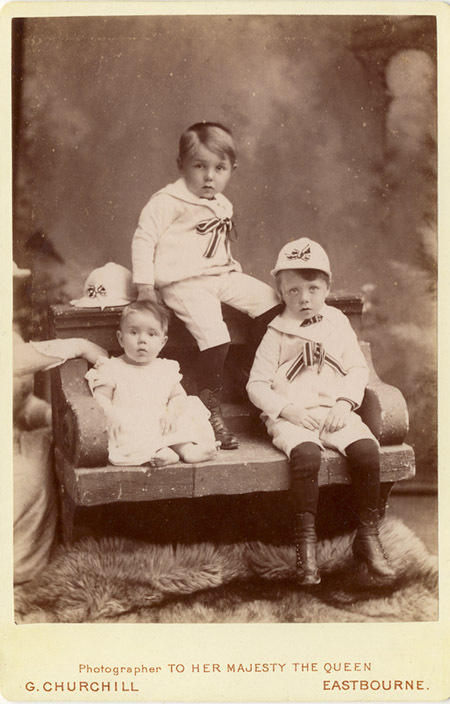 [ABOVE] A cabinet portrait of three children sitting on a stone bench, photographed by George Churchill of 4 Cornfield Road, Eastbourne (1889). The arm of the children's mother can be seen steadying the seated baby on the left. [ABOVE] Publicity printed on the reverse of a cabinet portrait by George Churchill of 4 Cornfield Road, Eastbourne (c1888). The trade plate includes the Royal Coat of Arms and the printed legend "Photographer to Her Majesty the Queen & most of the Imperial & Royal families of Europe". [ABOVE] A cabinet portrait of a seated man holding a walking stick, photographed by George Churchill of 4 Cornfield Road, Eastbourne (1889). 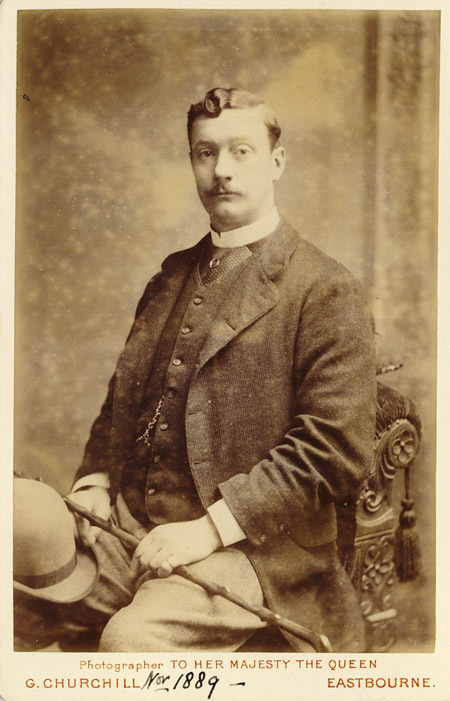 The front of the photograph is inscribed in ink with the date "Nov' 1889". [ABOVE] The trade plate on the reverse of a cabinet portrait by George Churchill of 4 Cornfield Road, Eastbourne (c1890). The trade plate includes the Royal Coat of Arms and the printed legend "Photographer to Her Majesty the Queen & most of the Imperial & Royal families of Europe". 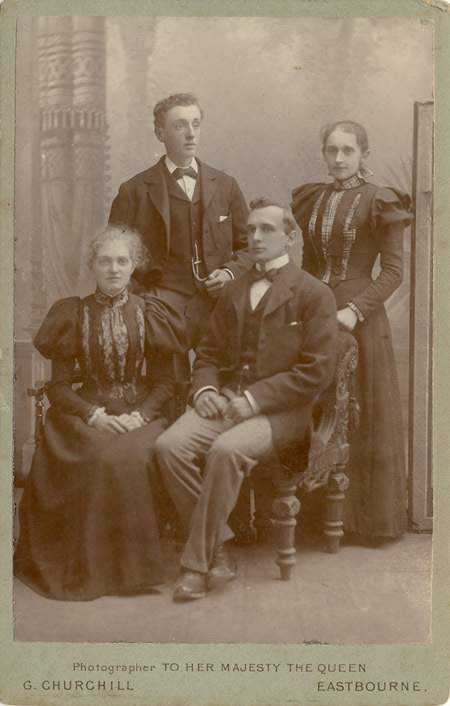 [ABOVE] A group portrait of two young men and two young women, produced as a cabinet photograph by George Churchill of 4 Cornfield Road, Eastbourne (c1898). 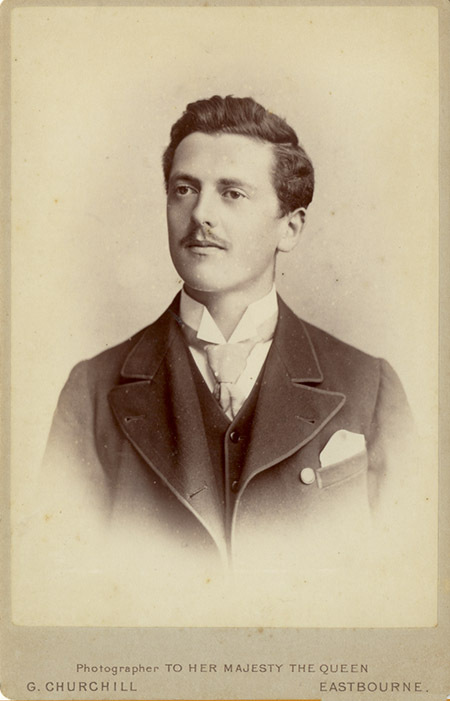 [ABOVE] A vignette portrait of a young man with a moustache, produced as a cabinet photograph by George Churchill of 4 Cornfield Road, Eastbourne (1892). 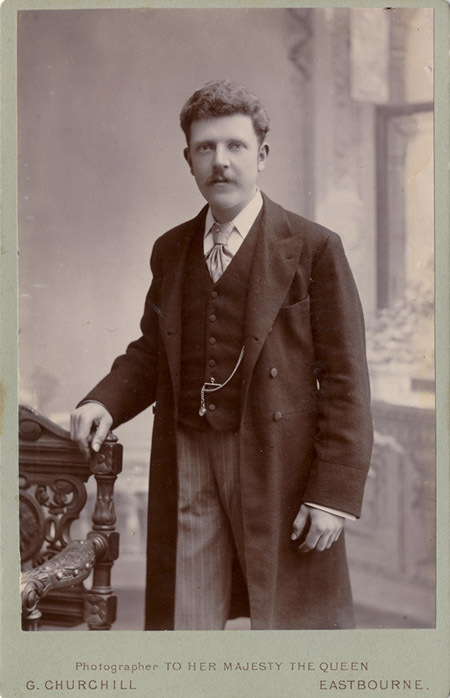 [ABOVE] A studio photograph of a man standing by a chair, produced as a cabinet portrait by George Churchill of 4 Cornfield Road, Eastbourne (c1898). 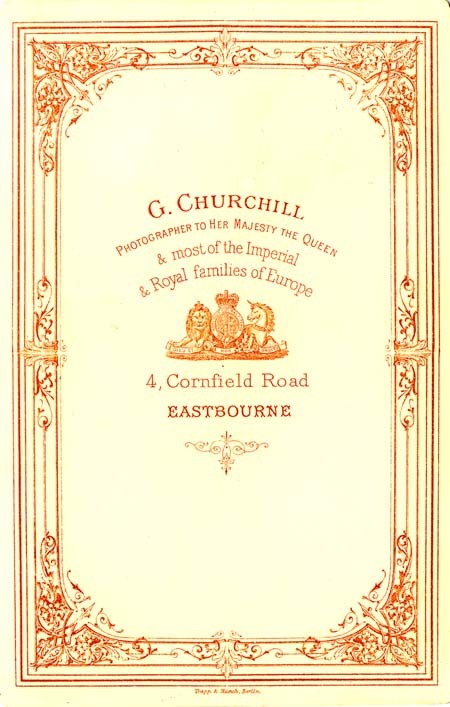 Printed below the photograph is the claim that G. Churchill was "Photographer to Her Majesty the Queen". 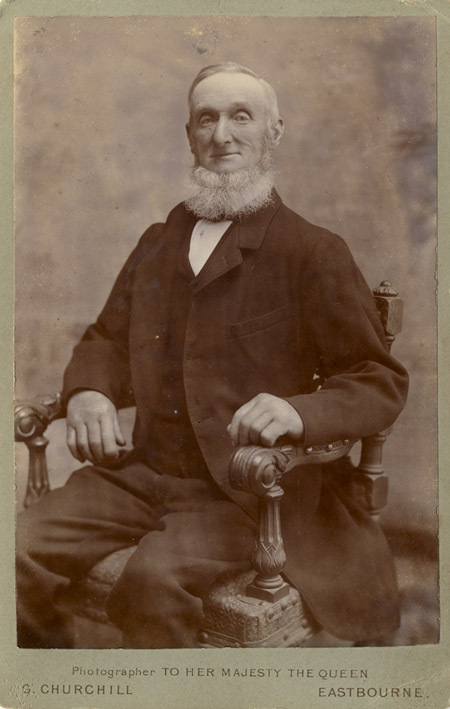 [ABOVE] A studio photograph of an elderly man with a fringe beard, produced as a cabinet portrait by George Churchill of 4 Cornfield Road, Eastbourne (c1896). Printed below the photograph is the claim that G. Churchill was "Photographer to Her Majesty the Queen". 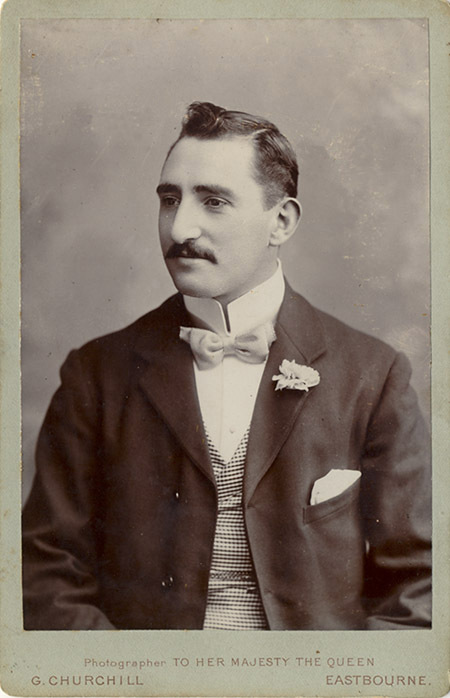 [ABOVE] A studio photograph of a man wearing a light-coloured bow-tie, produced as a cabinet portrait by George Churchill of 4 Cornfield Road, Eastbourne (c1898). 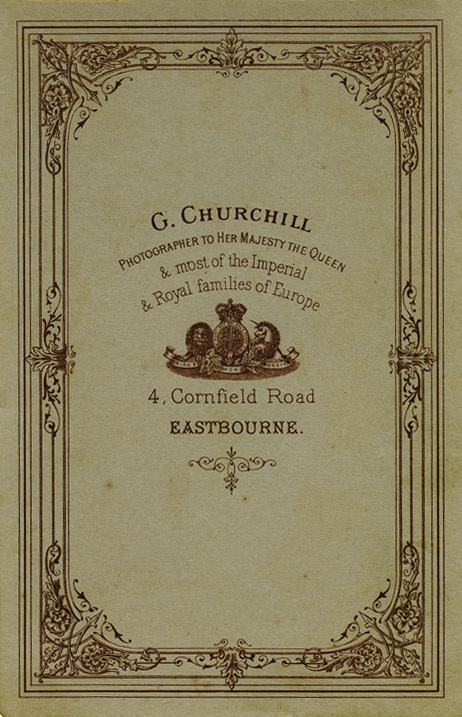 Printed below the photograph is the claim that G. Churchill was "Photographer to Her Majesty the Queen".